What’s your ideal family size? There is, of course, no ideal family size. Only children aren’t lonely children. Kids with lots of siblings don’t feel neglected. And if fate deals you a family that’s not the one you expected, you’re very likely to end up perfectly happy about that. Humans are very good at reframing, and when you look at the wonderful family you end up with, well, it’s hard to wish things were different. I have 4 kids. My parents had … one. Turns out, we all kinda wondered what the others were thinking. 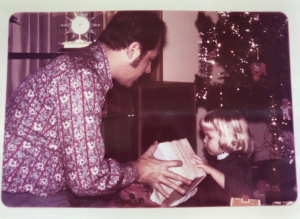 On this week’s Longest Shortest Time podcast, host Andrea Silenzi brought together me and my parents, turned on the recorder and asked us to talk it out. You can hear the result HERE (and it’s good). But the conversation got me thinking. How DO we decide how many kids is right for us? if you’re lucky enough to be making a choice about family size, here are a few questions to consider. How many sippy cups can you stand washing? How many haircuts do you want to schedule, how many socks will you match, how many car seats can you vacuum out? Big families mean lots of stuff, lots of logistics, realizing after you’ve ordered for five at the drive-thru that you must have forgotten someone. That sounds petty, but it’s a real issue. If the minutia of caretaking drag you down, one or two kids might be your max. Are you a chaos Muppet or an order Muppet? Big families, like the universe, tend overall toward disorder. Lower your guard for an instant, and entropy will take over your kitchen. If you enjoy unpredictability and thrive under unexpected challenge, a big family—where the odds that someone will barf in the night, break an arm or, on a more positive note, make the hole-in-one at mini golf that wins everyone ice cream—may be just right. Alternatively, if you love putting things in order (as opposed to living in an already ordered space) then keeping the trains running on time for four or five kids may also help you thrive. Interestingly, according to Muppet Theory, Order Muppets and Chaos Muppets tend to attract. If your partnership includes both of the above, a big family might bring you great joy. Still considering increasing your family size? Then here’s one final question: if your family was complete as is, if a fairy godmother came drifting down and issued a decree that what you have is perfect, how would you feel? Satisfied—or regretful? Because if you’re thinking about another kid, then here’s a little piece of research on happiness that might apply: we regret the things we could have done and didn’t more than our mistakes. Failure, disappointment—those we can accept. But when the choice is ours, and we don’t act—those are the regrets we hang onto. Money isn’t everything. Even sinks overflowing with sippy cups aren’t everything. If something is telling you you’re not done—then maybe you’re not. Feel like sharing ? Click HERE to pop up a fun, editable tweet or HERE for a Facebook share. 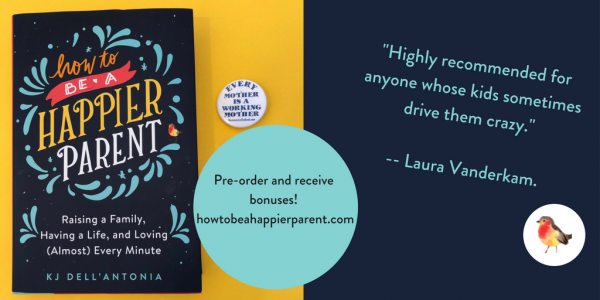 Hey—you’ll find even more like this in my book, How to Be a Happier Parent—on happier screentime, meals, chores and more, no matter how many kids you have. If you’re one of the first 1,000 preorders, you can get a free Chatbook—a photobook made from your favorite pics that’s guaranteed to make you happier. There are still lots left, but better grab one now! 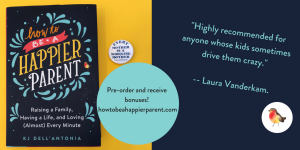 Not only that, but if you pre-order now, you will also get a one-page guide to Happier Mornings and a kid-friendly 10 Snuggly Reasons to Get Lots of Sleep printable. And, I’ll join you for a virtual book discussion group if you pre-order 6 copies or more!